Boniface Massawe, a doctoral student specializing in soil science in the School of Environment and Natural Resources and a Norman E. Borlaug Leadership Enhancement in Agriculture Program (LEAP) Fellow, will attend the World Food Prize events in Des Moines, Iowa, October 12-18, 2014. The World Food Prize honors outstanding individuals who have made vital contributions to improving the quality, quantity, or availability of food throughout the world. Eminent plant scientist, Dr. Sanjaya Rajaram, has been chosen as the recipient of this year’s 2014 World Food Prize for his achievements in wheat breeding technologies. Massawe is looking forward to the opportunity to meet and network with some of the top leaders in global agriculture and development at the event and especially meeting other Borlaug-LEAP Fellows from Africa to exchange ideas and experiences on different issues including research and training in agriculture. “Participating in the Borlaug-LEAP dialogue will also give me an opportunity to share my views on how agricultural land use planning can contribute to food security in the developing world. I will also have an opportunity to hear from other participants and panelists,” Massawe said. Kilombero Valley, Tanzania (his study site). Massawe's doctoral research intends to develop a crop (rice) suitability model using GIS and predictive soil mapping techniques in Tanzania’s Kilombero Valley. The Kilombero Valley is one of the largest seasonal wetlands in East Africa and the Tanzanian government, with technical and financial support from USAID, has targeted the Valley for increased rice production. 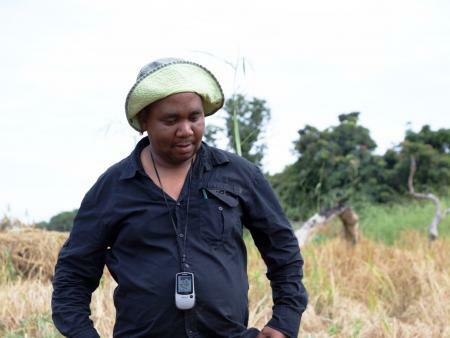 His research is expected to contribute evidence-based knowledge needed to make informed decisions on land resource usability as well as sustainability for rice crops. Massawe is advised by Brian Slater, assistant director and associate professor in the School of Environment and Natural Resources. Massawe’s research is funded by innovative Agricultural Research Initiative (iAGRI), a project under USAID sponsored Feed the Future Program. iAGRI is under the International Programs in Agriculture (IPA), in the College of Food, Agricultural, and Environmental Sciences. Massawe also has additional research funds from Borlaug - LEAP fellowship, which enabled additional field trips and training and collaboration with CIAT in Nairobi. Shown in photos: Boniface Massawe. Photos courtesy of Brian Slater.